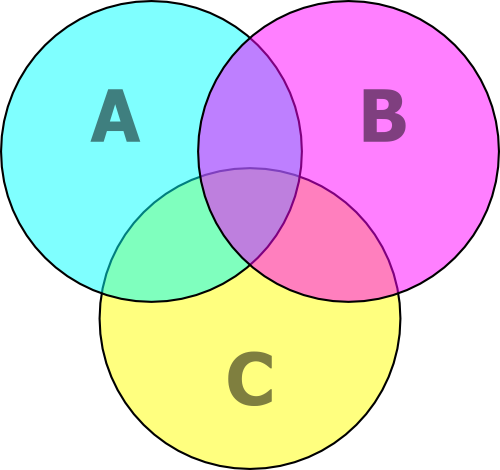 Draw three overlapping circles and labels them to represent the major, minor, and middle terms of the syllogism. Draw the diagrams of both of the syllogism’s premises. Two things always remember: (i) Always begin with a universal proposition, no matter whether it is the major or the minor premise. (ii)Remember that in each case you will be using only two of the circles in each case; ignore the third circle by making sure that your drawing (shading or × ) straddles it. Without drawing anything else, look for the drawing of the conclusion. If conclusion draws, then the syllogism valid. If No, then the syllogism invalid. Here are the examples of several other syllogistic forms. In each case, both of the premises have already been drawn in the appropriate way, so if the drawing of the conclusion is already drawn, the syllogism must be valid, and if it is not, the syllogism must be invalid. Therefore, All S are P.
(i) All P are M.
Therefore, No S are P.
(iii) All P are M.
Therefore, Some S are P.
(iv) All M are P.
(v) No humans are cats, and all humans are mammals . Therefore, no cats are mammals. (vi) Elephants are not tigers and no elephants are carnivorous, so no tigers are carnivorous.